Here goes one of the mouth-watering dessert from Kerala “Ada pradhaman”. Ada pradhaman is cooked with Ada, Coconut milk and jaggery, in the form of a thick liquid. Ada is the flakes of cooked rice. In olden days, Ada was made at home and used to make pradhaman. Nowadays we find readymade ada in almost every stores. I have used readymade ada from the brand “Nirapara”. 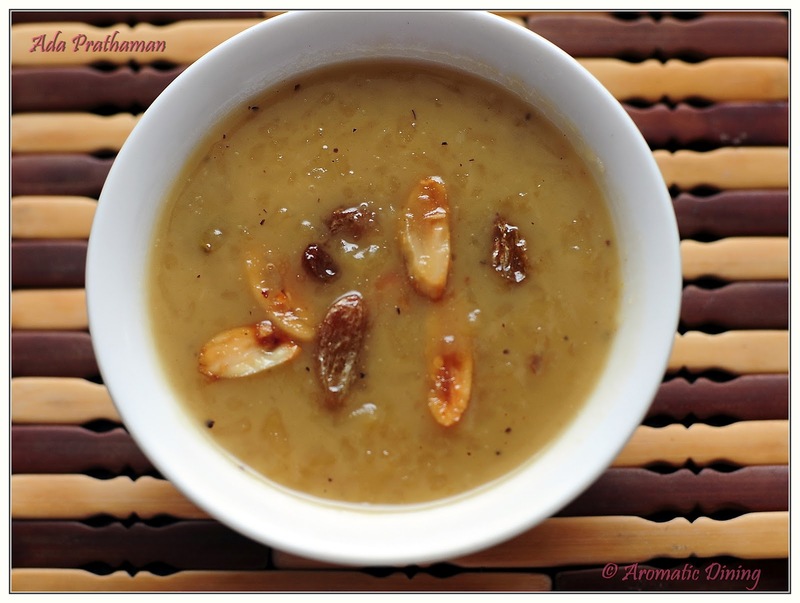 Pradhaman is similar to Payasam or Kheer but with more variety in terms of ingredients and the way it is made. 1) Ada should be cooked separately prior to cooking pradhaman. Since we are using readymade ada, it will be best to cook them according to the instruction given in the packet. For “Nirapara”ada, you should wash the ada in normal water and soak them in boiled water for about 15 mins and drain the water. 2) I have used coconut milk bought from stores. If you are having whole coconut, grate the coconut and sprinkle ½ cup of warm water. Grind the grated coconut and squeeze them to get the thick milk. Keep it aside. Add one more cup of warm water to the coconut and grind again. Squeeze them as earlier to extract the thin coconut milk. Use muslin cloth to squeeze. Otherwise use hands. 3) If you are going to use store brought coconut milk, you need to dilute them in order to get thin coconut milk. For thin milk take 1 cup of coconut milk and add 1 cup of water to it. For thick milk you can use directly. 4) Heat 2 cups of water in a pan and add the cooked ada to it. Cook them in medium heat. and filter using muslin cloth. 6) When the ada starts boiling reduce the flame to low and add the jaggery (Unrefined brown sugar). Stir well. 7) Add the thin coconut milk stirring continuously. 8) Allow it to cook for 10-15 mins and check the ada. It should be soft. 9) At this stage add the thick coconut milk stirring continuously. 11) Heat another pan with ghee. When ghee melts add the cashewnuts/chopped almonds, raisins and fry till it turns golden colour. 12) Pour the ghee along with nuts into the pradhaman. 13) Turn off the heat. Transfer to the serving bowl. 1) Adjust the jaggery (Unrefined Brown sugar) according to your taste. 2) It tastes best when used fresh coconut milk. 3) I have used almonds here instead of cashewnuts. You can also use pistachios & coconut chips for garnishing. 4) Serve them warm after meal. Usually I don’t have sweet tooth.. Hence I don’t show interest or spend much time on preparing sweets at home. Only you can find me holding sugar packet when there is festival..That was a day I planned to make Jalebi for Pongal 2012. My first time experience, so had to see loads of cooking videos. Finally I made up my mind with one recipe which combined all tips and tricks of few online recipes. 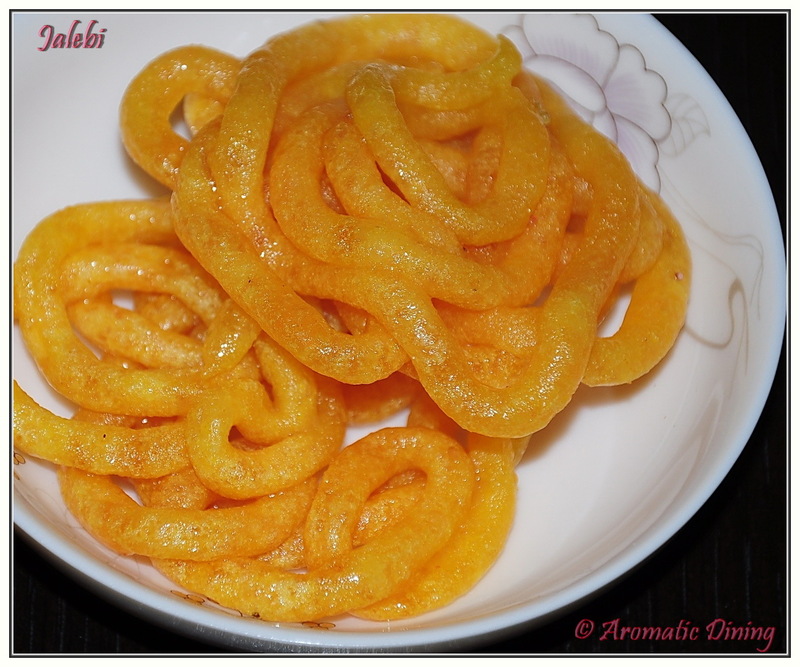 Jalebi looks yummy at stores but trust me its very hard to prepare at home. When I started mixing the batter I was so confident that I would get a wow from my hubby. 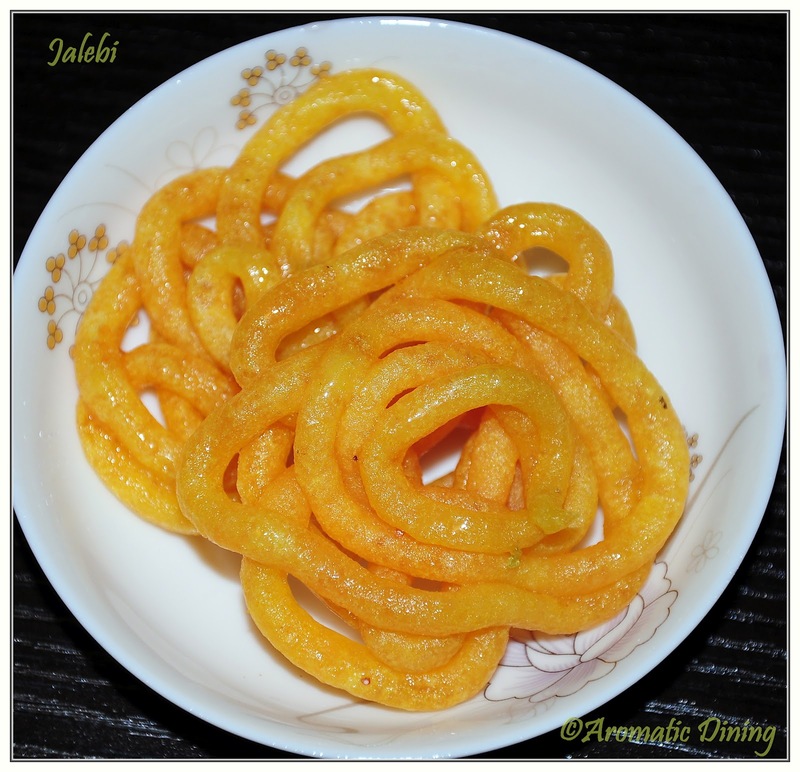 Then when I started squeezing the batter which was filled in zip lock cover into the oil I ended up getting a strange shape of Jalebi. For a second I thought ohhh!! This is it. I’ll give up..
Then thought myself not to worry about the shape and proceeded immersing that first Jalebi into hot sugar syrup, waited 5 mins. Had a bite to check the taste. Hmmm That was really a finger-licking thing!! So I decided to continue the rest of the batter to make Jalebi inspite of whatever shape I get. But I did adjusted the heat since I read somewhere in internet that the oil should be in medium heat. If it is too hot the Jalebi will disintegrate at the starting itself. If it is too low then the batter wont puff up. I admire only two Jalebis out of 12 Jalebis I made. That has been captured by my camera. Since its trial and error recipe I will post the full details of the recipe after I try one more time.